Back in the day, the PPCC studied Latin. As part of our curriculum, we watched every swords and sandals epic you can think of - notably Gladiator, Spartacus, Quo Vadis, and The Robe. For whatever reason, The Robe left us with a mixed, mostly bad impression - it was definitely the worst of the lot. But that was years ago, and, when we found it in our local DVD shop the other day, we gasped with delight, "Swords and sandals?! YES! And isn't this the one with Seneca?! OH, YES PLEASE." The Robe shares many characteristics with its 60s pop Roman brethren - most notably Quo Vadis (the one with "Seneca", though we were actually thinking of Petronius). Like Quo Vadis, it is a fable of Ancient Rome based on a modern novel. It examines the earliest days of Christianity from a Roman normative framework, provoking much delight in the modern viewer since we are privy to Christianity's historical importance, but the silly Romans have no idea. Indeed, Christian or not, there is a feeling of conspiratorial delight in watching The Robe's ignorant and arrogant Romans refer to Jesus as a "fanatic" and "dead magician". Ha! Wait 2000 years and that "dead magician"'s gonna be everywhere. Yet unlike Quo Vadis, a film which managed to keep its Christianity in check, The Robe positively overflows with zealous adulation. This renders it alienating to any viewer who doesn't consider themselves a Christian and, we would argue, even its treatment of Christianity borders creepily close to devotional superstition. The Robe begins very strong. Welcome to ancient Rome, land of glittering debauchery, the slave trade and vomitariums! 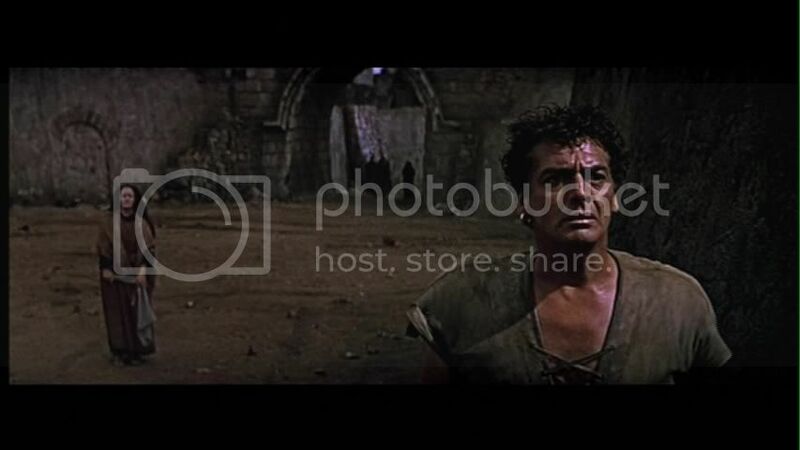 We are quickly introduced to hunky Roman tribune, Marcellus (Richard Burton), a self-described "drunk" who is busy buying some buxom babes on the slave market. 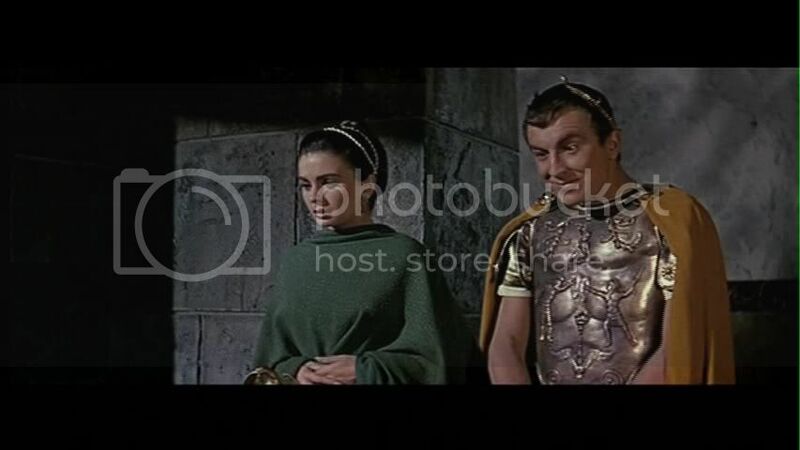 There, he runs into the chaste Diana (Jean Simmons), childhood friend and eventual love interest. Diana, however, is betrothed to the demented Caligula (Jay Robinson), which, if you know your Roman history, does not bode well. 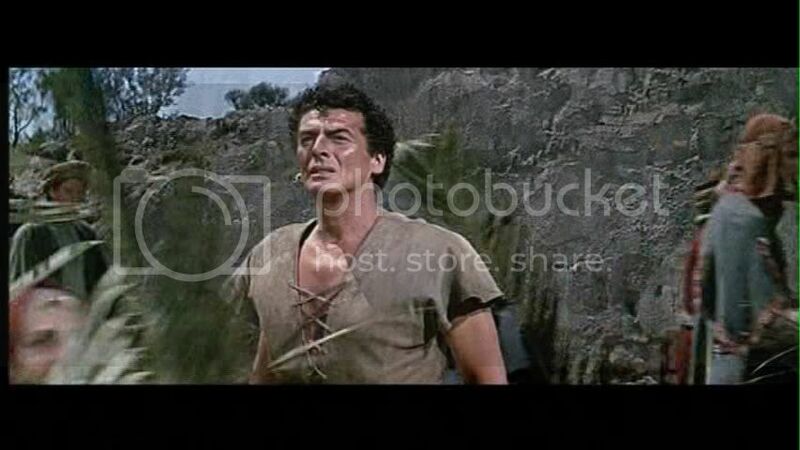 After Marcellus publicly insults Caligula by outbidding him for the hunky Greek slave, Demetrius (Victor Mature), Caligula banishes Marcellus to the "backwater of the Empire" - that is, Judea. (Or, as the characters keep calling it, Palestine.) Oh boy! Are you pumped? We were pumped at this point! Oh boy! Oh boy! If you recall your Roman history, Jesus lived under the reign of Tiberius, Caligula's predecessor. Hence when Marcellus and his loyal-yet-headstrong slave Demetrius arrive in ancient Judea, they waste no time in literally bumping into Jesus and his crew. One glimpse is enough to convert Demetrius, but Marcellus remains unaffected. Indeed, so unaffected is he that he barely bats an eyelid when Pontius Pilate orders him to execute Jesus. All it takes is one look to convert Demetrius. He spends the rest of the film staring in helpless adulation. Marcellus, though, can hardly be bothered to remove his hand from the trajectory of Jesus' bleeding. While Marcellus and his praetorian mates booze and gamble under the cross at Calvary/Golgotha, Demetrius picks up The Robe. As per Biblical record, the weather goes haywire and, when Marcellus orders Demetrius to cover him in said Robe, he is scalded by it. From that point on, he suffers from hallucinations and dramatic emo breakdowns. Demetrius, meanwhile, runs away to join the Christians. The Robe has cursed Marcellus to horrible, soul-gnawing angst! 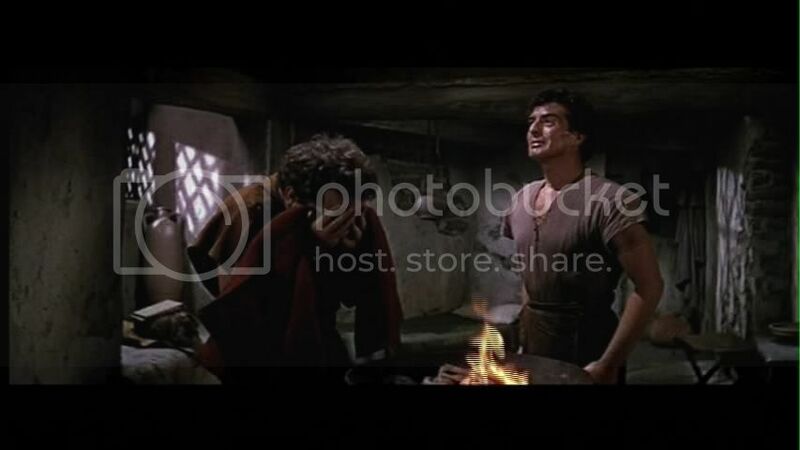 When Marcellus returns to Rome a broken and tortured man, sympathetic Emperor Tiberius orders him to return to Judea in order to (1) find Demetrius and (2) destroy The Robe, as it's probably "bewitched" him with the curse of craziness. The rest of the film follows Marcellus' return to Judea, meeting with Christians (including Peter himself), and eventual conversion. The film ends on a particularly zealous note. What's a shame is that this movie could have been so good. Some scenes, such as the bustling slave market or Marcellus' accidental witnessing of Jesus' procession into Nazareth (Edit: schooled in the comments, we meant Jerusalem... we are bad Biblical scholars), really do what they're supposed to do. In the former, we get a wonderful sense of the delirious busyness of cosmopolitan Rome. In the latter, we get a beautiful sense of awe as the heavenly choirs pipe up and we see the distant iconic image of Jesus on a donkey, waved forward by palm fronds. 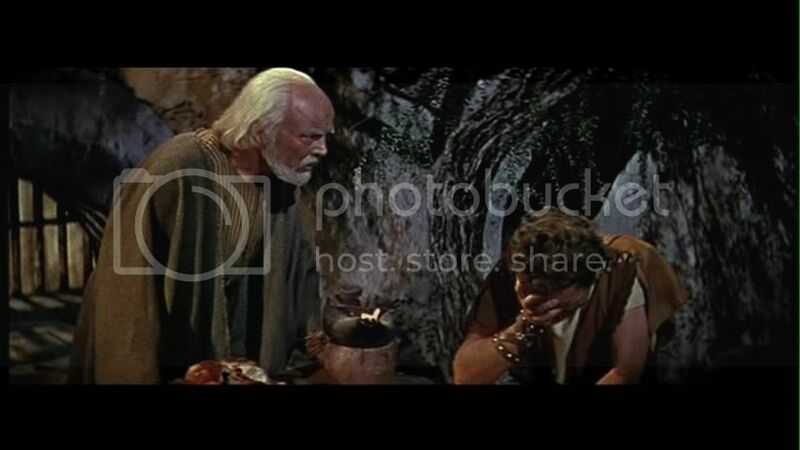 (Indeed, the film smartly maintains Jesus' mystique by never showing us his face.) Where the film goes very wrong is by preaching Christianity in blunt, glassy-eyed terms. In a way, it assumes the audience's worship of Jesus, so that Demetrius' insta-conversion - which, again, took all of a single glance, hello! - is supposed to seem natural instead of, well, bizarre. The blunt black-and-white treatment is emphasized by Caligula's maudlin villainy. We've seen crazy emperors before - Peter Ustinov as Nero in Quo Vadis comes to mind - and it's true that Caligula was legendary for his craziness, but this guy was just ridiculous. He didn't seem like an insane potentate, he just seemed like... well, a bad actor. Similarly, everyone's reaction to the new Christian thing seems to be, rather than a thoughtful and complicated reaction to a new philosophy, more like catching some sort of craziness disease (a la the "Godhead" disease in this excellent science fiction story which we will here tangentially advertise). Just watch empty-headed Diana's final insta-conversion, just scenes after she (fragile woman that she is) declared herself "too weak to have faith". Oh, come on! Oh well. You can't have everything. In a sea of pretty dreadful acting, Richard Burton did very well with his difficult role. Although his emo breakdowns were a little silly (and this is coming from us, the PPCC, lovers of limp-wristed "Nahiiins! "), he still presented a believable characterization of the slowly awakening Marcellus. 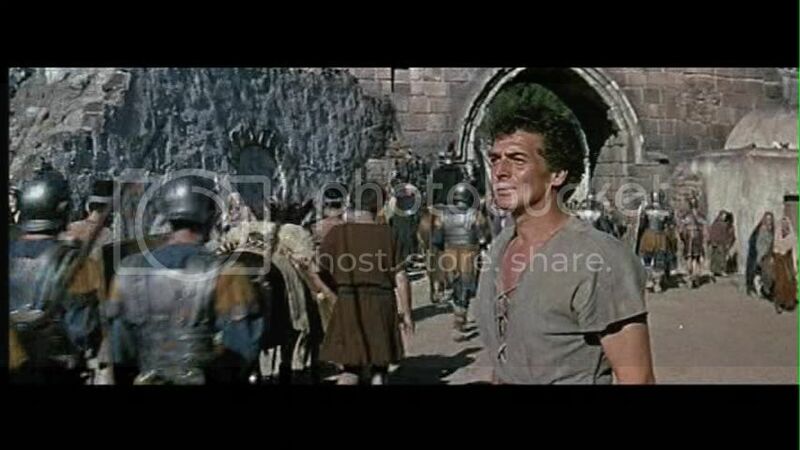 Unfortunately, everyone else was pretty bad, with the possible exception of Michael Rennie as Peter, who looked like the poor man's Charlton Heston but was thankfully restrained, and Victor Mature, who was likewise restrained (despite all the staring). "it [The Robe] was definitely the worst of the lot." 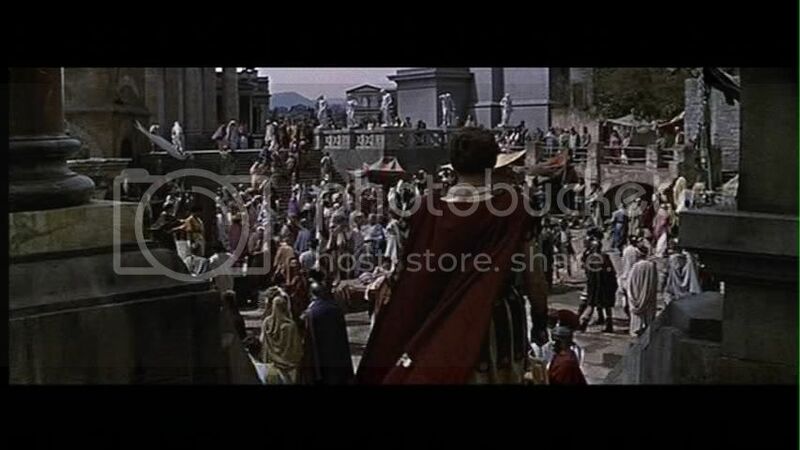 You dont like Kirk Douglas/Robert Taylor/Richard Burton strutting around in full Roman glory? lol. Have to admit I loved Quo Vadis (it might have had something to do with Robert Taylor - who else can carry off an American-accented Ivanhoe?) 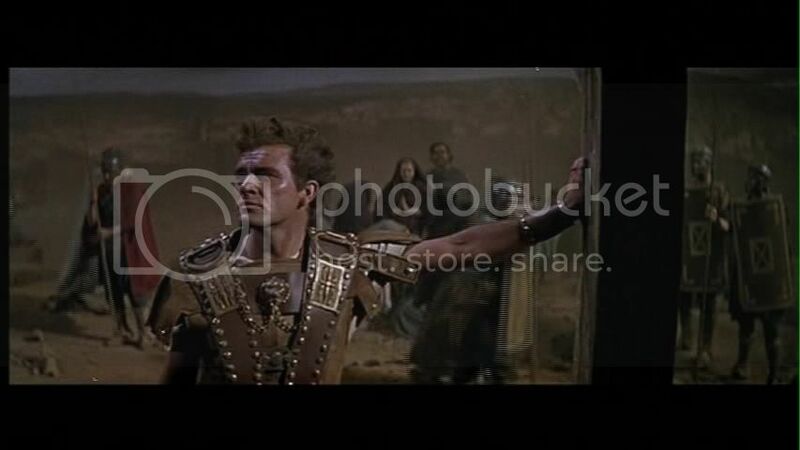 and Richard Burton is always a great idea - inspite of that mohawk look! I remember this one from growing up. They always showed on telly around Easter, dubbed into German, of course. I have a soft spot for it; a bit like I have a soft spot for cheesy pictures of Our Lady; but I can also see how it might grate. I didn't know it was based on a novel. And a, very minor, quibble: I am pretty certain it is Jerusalem Jesus enters on a donkey while people wave about palm fronds; not Nazareth. Well, in that case I no longer hesitate to bring Dilip Kumar and Meena Kumari's Bimal Roy directed Yahudi to your attention. It literally means "Jew" and is the merry tale of petty Jews and Romans and all the ways they like to screw each other over. There are lions! Cauldrons of boiling oil! People put their own eyes out! Kidnapping! Princes! Names like Brutus and Ezra and Elijah! I second Amrita's suggestion. It is great! And after all, Romans speaking Hindi isn't really any more weird than Romans speaking English. Gebruss - Aw, I can understand that, and I'm sorry for criticizing a childhood fave. And OMG I'm so embarrassed, of course you're right - Jerusalem! WOOPS. Amrita - You had me at Dilip. That sounds dizzying! Will investigate if Grumpy Uncle, Provider of All Things Old, has it. Gebruss2 - Haha, true! Though, for some reason, Romans speaking in a British accent is more acceptable than Romans speaking in an American one. I am silly. PPCC, my father is a Roman historian and was on various regional councils for the teaching of Latin and was always going hither and yon across the state to talk to Latin classes at the handful of high schools that still taught it - that is, you'll be the child he never had. I think I'll stick with Rome, the series from HBO. Like the P-PCC, I also studied Latin for lo these many years and got way too interested in gossip two millenia old.